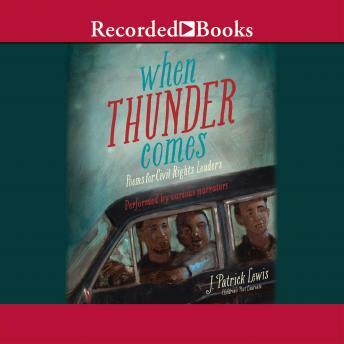 In moving verse, Children's Poet Laureate J. Patrick Lewis gives new voice to seventeen heroes of civil rights. Exquisitely illustrated by five extraordinary artists, this commanding collection of poems invites the reader to hear in each verse the thunder that lies in every voice, no matter how small. Featuring civil rights luminaries Coretta Scott King, Harvey Milk, Mohandas Gandhi, Nelson Mandela, Sylvia Mendez, Aung San Suu Kyi, Mamie Carthan Till, Helen Zia, Josh Gibson, Dennis James Banks, Mitsuye Endo, Ellison Onizuka, Jackie Robinson, Muhammad Yunus, James Chaney, Andrew Goodman, and Michael Schwerner.